BedBugsRemovalGuide.com is an expert site, which provides everything you need to know about bed bug in great detail, including pictures, symptoms, and treatment. Bed bugs, by its name they are always confine to bed, or sometimes sofa, carpet, and usually sneak out to feed at night while the hosts are sleeping. We do not feel pain at night as bed bugs tend to inject some compound to keep our blood ant coagulated and also anesthetic effect to minimize interruption to the hosts. - Multiple small, flat or raise welts on the skin that will always appear in a linear three in a row or clustered pattern because of the bed bugs tendency to feed on the same location more than once. - Rashes may last from few days to few weeks, longer in those allergic prone individuals. - Tiny blood spots on bedding materials of dead bugs that are crushed during feeding or staining on the mattress from the waste of the bugs. 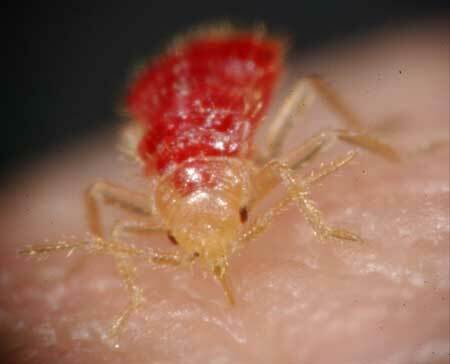 - Bed bugs feeds on certain areas, such as face, neck, back, hands, arms and legs. - Once you realized you are bitten, it is encouraged to wash it under running tape water for a minute or two to reduce severe itchiness. - You may also apply antiseptic soap and cream after that to reduce inflammation and itchiness. - For severe itchiness, oral antihistamines are always recommended. - Antibiotic is not recommended at first presentation, unless the rashes progresses to secondary infection by bacteria. Once bitten, not only you need to treat yourself, but you must do something to prevent similar event from happening again. - Inspect your room, sofa, and carpet, contact Pest Control if brown critters were found. - Clear away unwanted clutter and clean your room thoroughly. - Seal any cracks in the wood floors. - Wash all bedding and clothing in hot water for at least 20 minutes. Bed bugs are very sensitive to heat and will die at temperatures above 120°F. - Use a quality bed bug spray to kill off any visible bugs. - Follow up the treatment with professional insect powders such as Diatomaceous Earth by applying it around the bed and carpet to defend the perimeters. - Use thick, double-sided tape to tape it around the bottom of the bed frame or use professional traps as a tool to detect and prevent bed bugs before they bite. - Use bed bug proof covers that are designed to contain fleas and bugs, this can prevent the bed bugs from coming out at night. Hi, I see your blog. It is very good I hope you will see my blog. You show some very valuable information. So, nice! This is very nice post! I will bookmark this blog. There are unique items developed for different circumstances to are eligible of clients. A bed bug pitfall is a very effective way to avoid them from raiding your bed and other furniture. You can position a Go up Up bed bug traps under the bed thighs of your bed or even under your seats in the dinner area. Excellent article on the different types of auto insurance coverage and they are important. Your clear presentation is easy to understand and very well written. Any time you’d like to write and submit an article to my site, just let me know. Bedbug traps are legendary multipliers. Consequently, they can develop to vast quantities throughout your house very easily. One of the most essential factors you can do for bed bug management is to observe the attack to recognize just how big of a issue you really have. Nice post. These tips are very useful especially to those who want to avail in this topic. This is very nice post! I will bookmark this blog. There are special products designed for different situations to meet the requirements of customers. A bed bug trap is a very efficient way to prevent them from raiding your bed and other home furnishings. You can get rid of bed bugs under the bed legs of your bed or even under your chairs in the dining room. This is such a great post but I'm looking forward to see a post regarding on bed bug exterminators Toronto. It is easy to know more about extermination process and other aspects of bed bugs through the internet site www.torontobedbug.ca . The bed bugs removal guide is something to take very seriously, it a way of ensuring that your bedding and any other place around the house have been secured from these itchy pests. There is no peace as long as bedbugs are around, making it very necessary to read and understand this kind of a post.